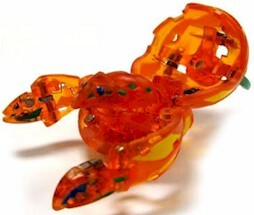 Stug is a hermit crab-like Bakugan. It has two immense pinchers that have spikes inside. Six barbs surround its hard shell to protect its body. Its four legs give Stug great maneuverability to avoid attacks. Perished long ago and was resurrected by the Vexos Mylene as an energy body. Purchase Stug from Amazon now!